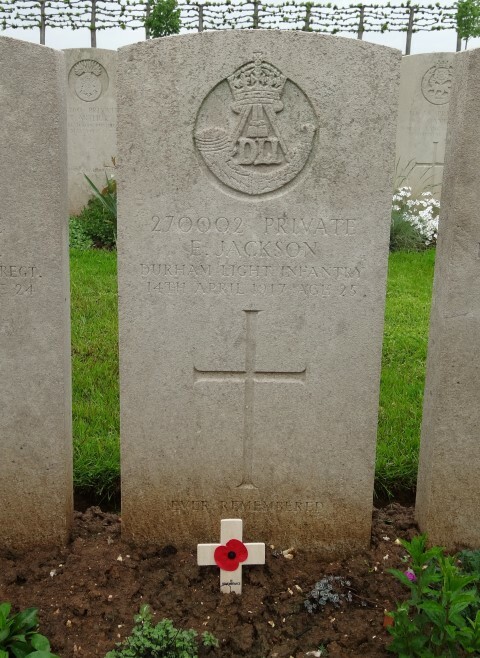 270002 Private Edward Jackson, 6th Battalion, the Durham, Light Infantry died of wounds 14 April 1917 and is buried in Duisans British Cemetery, Etrun, France. He was 25 years old, married and is commemorated on the West Auckland War Memorial and the Roll of Honour in West Auckland Memorial Hall. In 1891, the family lived at 99 Vaughan Street, Grangetown where 45 year old year George was employed as a general labourer. By 1901, 14 year old lived at Acrum Farm, West Auckland where he worked as an “ordinary agricultural labourer”. He lived with 65 year old widower George Atkinson and his family, farmers. By 1911, 24 year old Edward lodged with Frederick Caygill and his family at 6 Wilkinson Street, Byers Green where he was employed as a coal miner (hewer). In 1915, Edward married Mary A. Morley at Bishop Auckland. Mary remarried, John W. Charlton in 1919. She later lived at 10 Waldron Street, Bishop Auckland. The service record of Edward Jackson has not been researched. 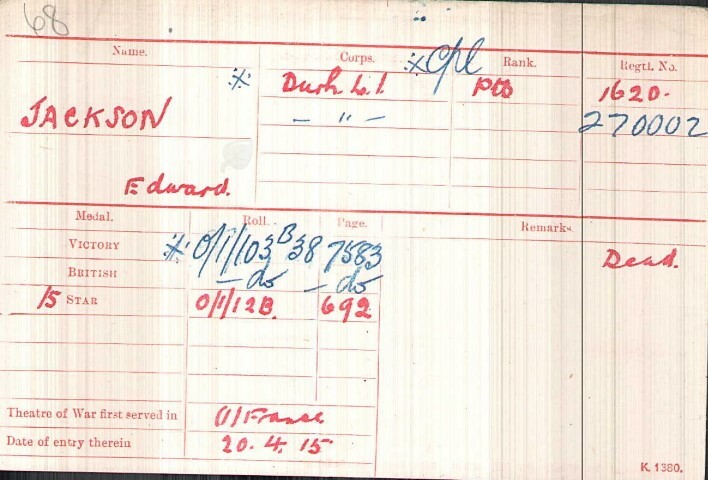 Edward Jackson joined the local Territorial Force, the 1/6th Battalion, the Durham Light Infantry (DLI) and was given the regimental number 1620. At a later date he was allocated reg.no.270002. 16 April 1915: the Division moved to France and served with distinction on the Western Front throughout the war. 1620 Private E. Jackson entered France 20 April 1915  with his Division and 6/DLI. The battalion suffered heavy casualties at the Second Battle of Ypres when the 50th Division took part in the Battle of St. Julien 24 April – 5 May, the Battle of Frezenberg 8-13 May and the Battle of Bellewaarde 24-25 May. In June 1915 the battalion merged with the 1/8th to become the 6/8th then it returned to its original identity 11 August 1915. The objective of the British and Canadian Corps was to capture Vimy Ridge which would lead the way into the Douai Plain and (it was hoped) the un-entrenched German rear. Then a rapid advance by the cavalry would link up with the French forces which would have broken through at Chemin des Dames, 80 miles to the south. The infantry was able to shelter in the great subterranean quarries at Arras and they were brought to the front line through tunnels dug by the Army’s tunnelling companies. Similar tunnels had been dug at Vimy Ridge for the Canadian troops. Such preparation did not arouse suspicion amongst the Germans and von Falkenhausen, commander of the Sixth Army kept his Reserves 15 miles behind the front. The German defences were bombarded by 2,879 guns, one for every 9 yards of the front, which delivered 2,687,000 shells – shorter in duration but double the weight of that delivered before the Battle of the Somme the previous July. 9 April: The first day of the battle was a triumph for the Allied forces. In a few hours the German front had been penetrated to a depth of between 1 and 3 miles, 9,000 prisoners were taken, few casualties suffered and a way forward was (apparently) cleared. The success of the Canadians at Vimy Ridge was sensational! But the usual inflexibility in the plan prevented further progress – a pause of 2 hours after objectives had been gained, the day was shortening and the impetus ran out allowing the Germans to bring up their reserves 10 and 11 April. The April weather was atrocious – rain, sleet, snow, relentlessly low temperatures and the shelling had turned the chalky surface into gluey mud. The attacking troops were exhausted, a halt was called to allow casualties to be replaced and the troops to recover – losses totalled nearly 20,000 (1/3rd of casualties suffered at the first day of the Somme). 23 April: hostilities recommenced, the Germans had reorganised and were reinforced so could counter-attack and as a result, a month of attrition set in bringing a further 130,000 casualties for no additional gain of ground. On the southern front, whist the Germans were caught by surprise on the Vimy-Arras sector, they were not on the French sector, Chemin-des-Dames. Security failures had alerted the Germans to the proposed attack so their forces were prepared. After 5 days of intensive fighting when the French suffered 130,000 casualties including 29,000 killed, the offensive was effectively abandoned. There had been a penetration of 4 miles over the 16 mile front but German defences remained intact. There had been no breakthrough. The 50th Division formed part of the VII Corps of the British Third Army and was responsible for the capture of Wancourt Ridge. 4 April: Orders were received for the Division to move eastwards and on the 6th and 7th April. The 149th and 151st Brigades moved to the Rollecourt area and the 150th went to Houvin-Houvigneul then all combined 7 April in the Avesnes area. 10 April: A further move to Habarcq-Wanquetin area took place when the 149th occupied the Wanwuetin-Hauteville area, the 150th was at Habarcq and the 151st was at Agnez, Gouves and Montenescour. The 7/D.L.I. (Pioneers) moved into Arras. 11 April: The Division relieved the 14th Division. The 149th Brigade was the first into the line and occupied trenches to the south of Tilloy and straddled Telegraph Hill. The 151st moved up to Ronville Caves and the 150th remained at Habarcq. Within this new sector was the recently captured ridge to the immediate east of Wancourt and Heninel. The 56th Division was to the right and the 3rd Division was to the left. 14 April: Orders were received for an advance. The 50th and 56th Divisions were to attack, the 56th to capture Cherisy and the 50th Division was to protect the 56th left flank facing north along the high ground south of the 80 Contour with their left in Wancourt Tower. The 2 leading companies were to advance hugging the left flank of the 169th Brigade (56th Division) then when the 169th came to a standstill, the 2 leading companies of the 6/DLI were to halt also and refuse their left flank, the 3rd and 4th companies were then to prolong the refused flank. The 6/DLI had the Wancourt Tower to their left. As the attack commenced, a German barrage came over the lines but it appeared that the 6/DLI passed through it successfully. The 6/DLI and 8/DLI were intermixed and hostile machine gun fire made movement impossible. There is no mention of the 3 counter attacks in any official diaries. There is a lack of detail but the 50th may be proud that “The Capture of Wancourt and Ridge” was sufficiently important to be included under heading of “Tactical Incidents” of Battle by the Battles Nomenclature Committee. The First Battle of the Scarpe 1917 officially ended 14 April. During the night of the 14/15 the 151st Brigade was relieved by the 149th Brigade and moved back to support. The 150th was still in reserve. The Diary of the Divisional HQ records that casualties were estimated at 16 officers and 213 other ranks killed, wounded and missing. “At 1 am on the 14th April the men moved to the assembly position in the dry bed of the Cojeul River with the 8th Battalion in support and the 5th Border Regiment in reserve, the 9th Battalion being already in a line just south of Guemappe. The original orders had now been considerably altered and zero hour arrived before fresh orders had been circulated to the companies. The result was that at 4.30am after moving in file from the assembly position to a bank some 200 yards in front, the Battalion advanced under a barrage in 4 waves of companies W being front Z in rear, with no orders except a rough indication of the direction. As they advanced they were met by very heavy machine gun fire from the front and from Guemappe in their left rear. W and X companies reached the ridge 500 yards from the starting point and passing down the other side were not seen again during the day. Y and Z companies also reached the ridge but could get no further. Later they were joined by the 8th Battalion which was also held up. The fighting then died down but apart from one brief message from X company no trace could be found of the 2 front companies and the casualties in the remaining 2 were very heavy. To add to the confusion, the 56th Division on the right had lost direction and men of the London Regiment were everywhere mixed with those of the 50th Division. At dusk orders were received that the line on the ridge would be taken over by the London Rifle Brigade. A soon as the light permitted search was made for W and X companies. Eventually the remnants consisting of 4 officers and about 20 men were discovered. Having reached a small system of trenches they had organised their defence and successfully beaten off determined attempts to surround them. About 80 men were finally assembled after the relief and more joined the Battalion during the next few days but the casualties amounted to over 200 or more than 50% of the total fighting strength. The officers killed were Capt. Brock, Lieut. Richardson and 2/Lieuts. Greene, Payne and Newton whilst many were wounded Capts. R.S. Johnson and H. Walton, commanding W and X companies were subsequently awarded the Military Cross and Corporal Betts the D.C.M. and Croix de Guerre. 270002 Private E. Jackson was brought into 41 Casualty Clearing Station and died of his wounds, 14 April 1917. Another 2 local men, 250393 Private W. Greavison from Etherley and 250297 Private C. Simpson were killed on the same day. Both have no known graves and are commemorated on the Arras Memorial. Private Edward Jackson was awarded the 1914-15 Star, the British War and Victory medals. Private Edward Jackson is commemorated on the West Auckland War Memorial and the Roll of Honour in West Auckland Memorial Hall. Soldiers Died in the Great War details record that 270002 Private Edward Jackson was born and enlisted at Consett which is probably incorrect. “The Story of the 6th Battalion Durham Light Infantry” Capt. R.B. Ainsworth (1919) NOTE: “The Faithfull Sixth: a history of the 6th Battalion, the Durham Light Infantry” H. Moses (1995) p.82-85 describes the battle.